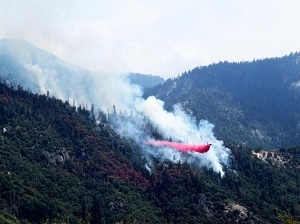 The Horse Creek Fire in Sequoia National Park is growing, spreading Sunday to more than 30 acres in a high-terrain area dense with dead trees. The fire is visible for several miles on the south side of the Mineral King Road and Slapjack Creek, National Park officials said. Since the fire is burning in a steep, dense part of the forest, firefighters are mostly using helicopters and air tankers to battle the lightning-caused blaze. The NPS is asking the public to avoid using Mineral King Road. Traffic conditions have been exacerbated by visitor interest in seeing and taking photos of the fire from the road. However, at this time neither the road nor any structures are directly threatened by the fire, and the road remains open, the NPS said. Both Sequoia and Kings Canyon national parks remain open. The Atwell-Hockett Trail and the Tar Gap Trail are closed due to the fire, though. Near Yosemite National Park, the Ferguson Fire was steadily growing over the weekend and two more firefighters were injured while battling the flames in blazing summer heat to protect mountain communities. The fire grew to 30,493 acres by Sunday morning, and moved within about two miles of the northwestern portion of the national park, fire officials said. Yosemite remains open, but one of its scenic routes, Glacier Point Road, was closed to stage firefighters. Flames have charred about 42 square miles (110 square kilometers) of timber.